Inks, sprays and mask for the background, added other elements to create a collage style layout. Tuesday Treasures is about linking up something special to share with others, so if you have a Treasure to share this week, please link up below. I will definitely pop over to have a look and hopefully others will too. This is superb Brenda and all the colours go so nicely together. Can see why this is a treasure to you! Fabulous page to capture a treasured moment Brenda. 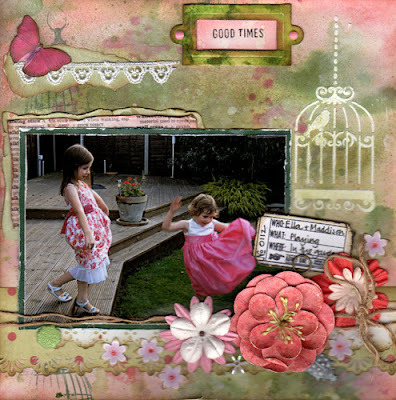 A really gorgeous layout Brenda and your little cuties look so sweet. This is so beautiful, Brenda...cherish such lovely treasures! What a gorgeous page to show off a lovely photo of your little treasures!! I love your background colours...a perfect backdrop. What a gorgeous layout, Brenda! I love the way you used the sprays over the birdcage stencill and how you journaled on the ticket. Thanks for joining us at Frilly and Funkie this week! Beautiful layout Brenda, love the background especially the bird cage. gorgeous affect the masking gives, hope you have a wonderful day! Gorgeous background! Love the blended ink look with the masks. Love to see a layout as well. Thank you so much for playing along with us at Frilly & Funkie!!! Brenda, this is such an adorable layout! Love how sweet the little girls look in their pretty dresses! Fabulous background and masking really frame the picture perfectly! Thanks a bunch for joining in at Frilly and Funkie! It's a wonderful LO, lovely photo. Stunning and such a wonderful way to preserve the special memories! Delightful layout for such a sweet photo!